Mordian 7th Regiment: NOVA Open Charitable Foundation Army - Thallax painting begins! NOVA Open Charitable Foundation Army - Thallax painting begins! With the days slipping by toward NOVA, it is high time I got off my duff and start painting up the two Thallax cohorts intended for inclusion in the NOVA 2017 charitable auctions! 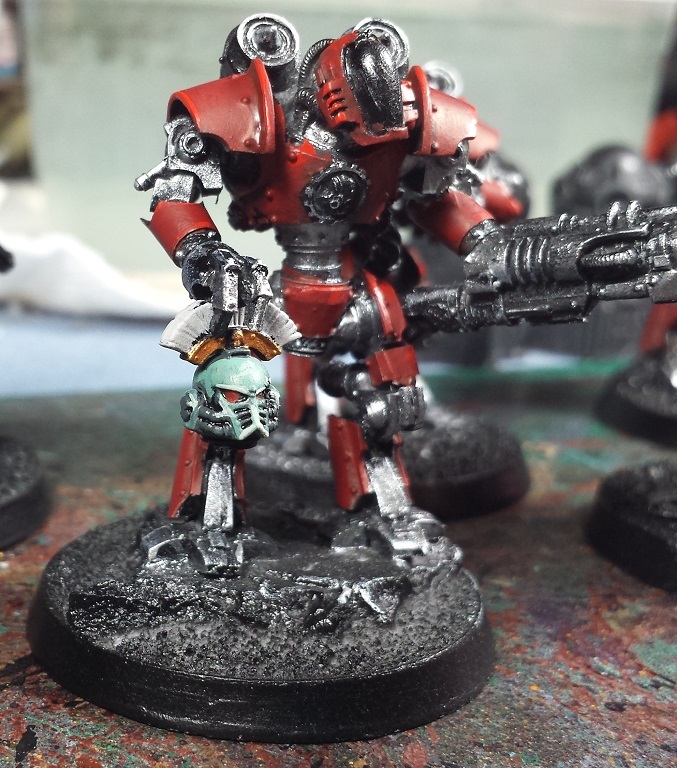 Nothing too fancy just yet, just laid in the underpinning metals and got the red armor plates on. We've been provided a painting guide for paint recipes but otherwise have been given fairly free rein on the details. A goodly chunk of the metallics will be getting some further verdigris bronze sections, and we'll get some greens and blues in there as well on various cables and coils! As a bit of a nod to the Heresy Sons of Horus charity army also up for grabs, I thought it could be amusing to have one of the Thallaxi be holding up a trophy helmet. Rather liked how the sea green turned out, which is dangerous. ...I think it may be a foregone conclusion that I'll have to do a Sons of Horus army of my own once I get done with the Thousand Sons. I have always wanted to build and paint Horus, Abbadon and Loken after all! Looking awesome! I especially love the SoH helmet! Always liked how you do red, armour plates look ace there. @Marc Raley: Thanks man! Going to have to pay a bunch of SoH soon, darn it! @Rory Priest: I appreciate it! It's a rather simple recipe - Dark Flesh, Red Gore, Blood Red and some Carroburg Crimson in the recesses. Easy peasy! Heresy Era Thousand Sons - Sorcerers Complete! Heresy Era Thousand Sons - Sorcerer Cabal begins! 40k Video battle report- Genestealer Cults vs Space Wolves - Today, I have a new video battle report. This sees my Genestealers Cult take on Chris' Space Wolves army in a maelstrom of war mission. Hope you enjoy!